Samuel Grimshawe II came from a rich merchanting family in Manchester. He was the son of a Manchester merchant of the same name, Samuel Grimshawe I, and married to Anne, the daughter of Otho Hume, a member of the Pitt Club. A former pupil of Manchester Grammar School, Samuel II held the office of Borough Reeve, for which he was qualified by previous duty as Sidesman at the Collegiate Church and as a constable. In 1824 he was living in Mosely Street. He was the member of the important conservative ‘Shawes Club’, and his entry in the membership list of 1825 reads; ‘Grimshawe Samuel, Millbank, at T. Heywood’s, Old Quay. Merchant. Aged 55. Grammar School. Court Leet Juryman and Assessor. Sidesman. Natural History Society. Director of Manchester Assurance Company. Married with a son and daughter, Samuel II lived some twenty years in Mosely Street, while two of his sisters lived in nearby George Street. He then moved to Mill Bank, a house on the banks of the Mersey at Partington which formed part of an old-established works and property, apparently acquired by the Grimshawes or the Hulmes. Before the mid-18th century, there had been a works there for ‘slitting and rolling’ iron, and when that gave way to a corn mill, a tariff arrangement was made with the Mersey and Irwell Navigation, and the millers corn transport was tied to the Navigation for 1,000 years, ‘so long as the river Mersey and Irwell shall remain navigable’. There had been a paper mill here in the 18th century at Mill Bank. Samuel II was on the Mersey and Irwell Navigation Committee and made considerable use of its facilities. 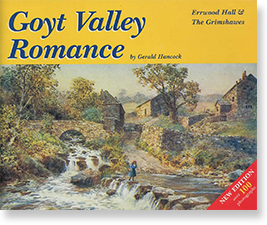 It was after 1835 that he began negotiations with John William Jodrell of Yeardsley Hall and purchased 2,064 acres of the Taxal Valley which included the Cat and Fiddle inn. But Samuel Grimshawe was promptly met by a challenge from the Earl of Derby (right). His Lordship owned extensive lands in the adjoining Macclesfield Forest, and alleged that the Cat and Fiddle was on that side of the boundary, therefore on his land. Dan’s recollections were too much for his Lordship of Derby and the Cat and Fiddle remained with the Grimshawes. Samuel Grimshawe II continued to live at Millbank, Partington, and still kept his house and business going there, while his son, Samuel III, was living with his mother and sister Margaret at the old Errwood Farm in 1841. They were probably living there while Errwood Hall was being built, with no doubt Samuel supervising the work. 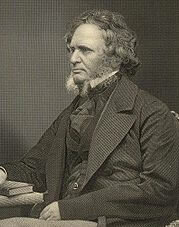 Samuel III was born in Manchester in 1811 and after receiving an early private education, entered Brasenose College, Oxford, at the age of 18. He graduated as a B.A. in 1830 and M.A. in 1833, and it was here he was influenced by John Henry Newman, eminent theologian, of Oriel College, who was a founder of the Oxford Movement. The movement, also called the ‘Tractorian’ movement because of the large number of ‘Tracts’, written to the Times, advocating their cause. Other leaders were Henry Manning, John Keble, E.B. Pusey, and R.H. Fraude. Newman, Manning and others became life long friends and converted to Catholicism, but not yet Samuel Grimshawe. 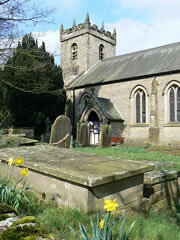 In 1843, Samuel III’s sister, Margaret Elizabeth, was married at Taxal Parish Church (left) to John Upton Gaskell of Ingersley Hall, near Bollington. The Gaskells were friends of the Grimshawes and fellow mill owners and indeed frequented the same Manchester club, ‘John Shaw’s’. One of the mills at Ingersley Vale was said to have the second largest water wheel in the British Isles, fifty six feet in diameter and ten feet six inches across the buckets. It was a walk or fulling mill producing ‘Fustian’, a type of heavy corduroy cloth. The following few years were mixed with joy and sadness. Great joy of a son; Samuel Arthur Hope, born in May 1850, but marred in June of the same year of the death of Samuel’s mother Anne. She lies buried at Taxal Church where there is a plaque erected by Margaret Elizabeth Grimshawe, the daughter, in memoriam to her parents Her father, Samuel II, died some seven months later, but is not buried at Taxal as the plaque seems to suggest, but at St. Peter’s Church in Manchester.